The Rats leaving a Falling House. A simpler and less animated composition on the same general idea as Edward W. Clay's ".00001" (no. 1831-1). 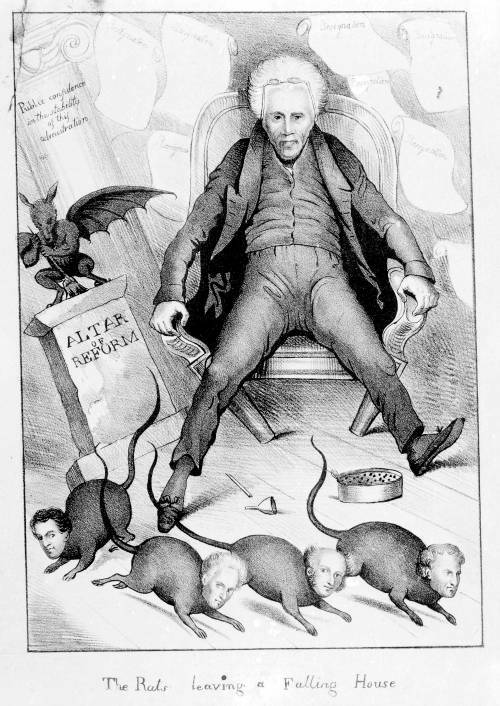 Again Jackson is seated in a collapsing chair, with the "Altar of Reform" toppling next to him, and rats scurrying at his feet. The rats are (left to right): Secretary of War John H. Eaton, Secretary of the Navy John Branch, Secretary of State Martin Van Buren, and Treasury Secretary Samuel D. Ingham. Jackson's spectacles are pushed up over his forehead, and his foot is planted firmly on the tail of the Van Buren rat. "Resignations" fill the air behind him, and a pillar marked "Public confidence in the stability of this admistration [sic]" falls to the left. There seem to be at least two versions of the print, not counting Clay's ".00001." The present version seems to be a close but inferior copy of the print by the same title attributed to Edward W. Clay by both Murrell and Davison. The latter has the legend "Washington 1831" printed in the lower margin. Davison quotes from an April 25 entry in John Quincy Adams'diary saying that "Two thousand copies of this print have been sold in Philadelphia this day. Ten thousand copies have been struck off, and will all be disposed of within a fortnight." It is unclear, however, whether Adams was referring to a version of "The Rats leaving a Falling House" or to Clay's ".00001" which was produced and published in Philadelphia and deposited for copyright on May 5.